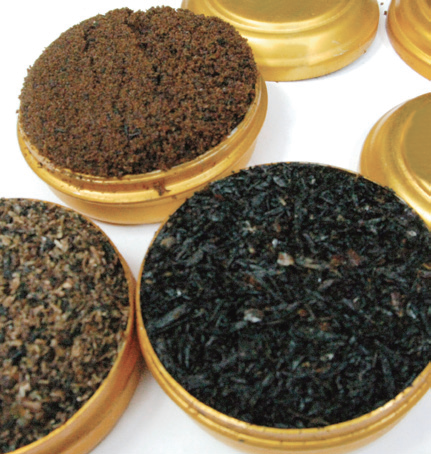 Omani incense refers to the mixtures of natural incense resins, woods and herbs which are heated on smoldering coals to release their fragrant smoke and aromas – as opposed to the well-known frankincense ‘teardrops’ that are burned on their own. There is an ancient and proud history of incense making in the Sultanate, and the mixtures and various combinations of incense are held in high esteem by the Omanis that produce them. 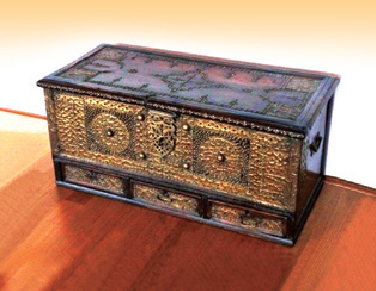 An Omani mandoos is a type of ornate wooden storage box traditionally crafted from rosewood, walnut, or other special wood. They are prized for their beauty, and are typically inlaid with brass, silver, precious stones, and even gold in geodesic designs that are inspired by Islamic art. They are traditionally used to store valuables, and are made in a variety of sizes – the largest being a meter or more wide, the smallest being jewellery box size. 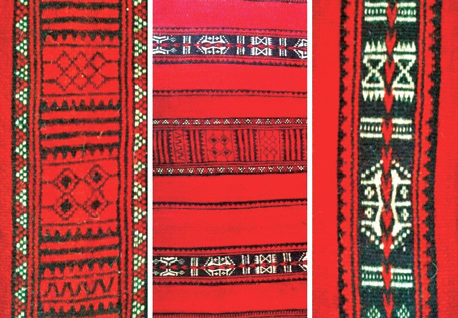 Most Omani rugs are traditionally made with woven sheep’s wool and goat’s wool. 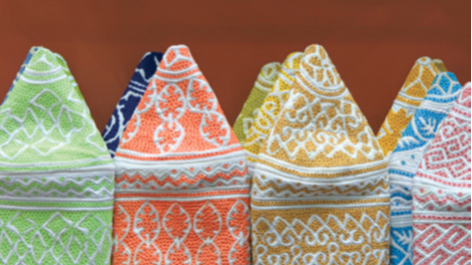 Many of them also feature colorful, striped designs, which are created with various selections of natural dyes. The people of the Sharqiyyah Sands region are especially well-known for their rug making ability, and their consistently high quality and very beautiful creations. In today’s fast-paced world, the idea of a good night’s sleep seems to have fallen down our list of priorities. But adequate rest plays an absolutely essential role in our physical and mental wellbeing. Health experts warn us that we can’t function to the best of our abilities without sleep – and we should be doing everything we can to make sure we ‘get a good night,’ every night! The brain has a chance to exercise important neuronal connections that might otherwise deteriorate due to lack of activity. Sleep gives the brain an opportunity to re-organize information to help find solutions to problems; process newly learned information; and ‘organize’ memories. Sleeping is a time for genuine rest. While we’re asleep, our metabolic rate and energy consumption is lowered. 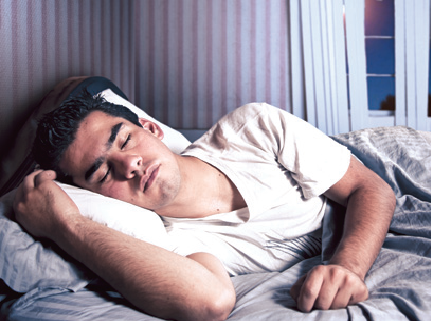 The cardiovascular system also gets a break during sleep. Researchers have found that people with normal or high blood pressure experience a 20% to 30% reduction in blood pressure and 10% to 20% reduction in heart rate. During sleep, the body has a chance to replace chemicals, and repair muscles and other body tissues and aging cells. Growth hormones are also released during deep sleep. But the most obvious reason why we need sleep is to consider what happens when we don’t get it. We’ve all experienced the moodiness, reduced alertness and concentration, reduced work efficiency, lack of motivation, poor memory etc, associated with a bad night’s sleep. The more serious consequences are accidents as a result of fatigue (falling asleep while driving, for example); depression; an inability to learn and process information at an effective level; health consequences as a result of weight gain; reduced skin health; and forgetfulness. Some studies also show that patients who suffer from a lack of sleep appear to have a significantly higher risk of developing cardiovascular disease. Stick to the same bedtime and waking times, even on the weekends. This habit regulates your body’s biological clock and helps you fall asleep and stay asleep, every night. Practice a relaxing ‘bedtime ritual’ before sleep time. A relaxing, routine activity right before bedtime conducted away from bright lights helps separate your sleep time from activities that cause excitement, stress or anxiety which make it difficult to fall asleep. Exercise daily. Even light exercise is better than no activity. But avoid exercising at the expense of your sleep, of course! Re-evaluate where you sleep. Experts recommend that the room where you sleep should be coolish (around 20 degrees Celsius); free from any disturbing noises; and free from any light. Sleep on a comfortable, good quality mattress, and use a pillow that is comfortable and supportive. Avoid alcohol, cigarettes, and caffeine and heavy meals in the evening. Some wellness experts even say we should avoid eating for up to 2 to 3 hours before sleeping. Your body needs time to shift into sleeping mode. Before going to bed, spend some time doing a calming activity like reading, drawing, or some light breathing exercises or meditation. Using an electronic device such as a laptop or Smartphone can make it hard to fall asleep because the particular type of light emanating from the screens of these devices is activating to the brain. 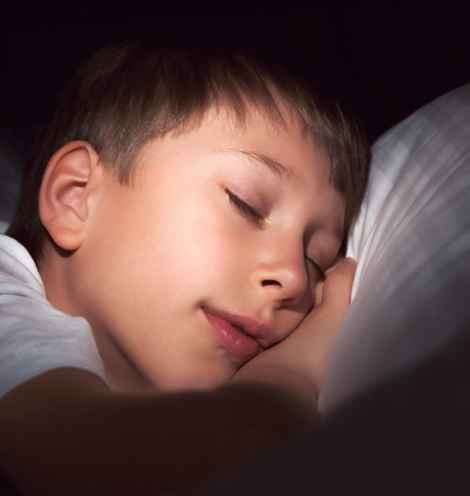 If you have trouble sleeping, avoid electronics before bed or in the middle of the night. The craft of Jerz making is unique to Musandam, and the local men here carry this long-handled axe as part of their traditional costume. In days gone by, the Jerz was used for chopping firewood; as a support stick while walking and climbing over Musandam’s rocky terrain; and occasionally, as a weapon of self-defense against wild animals. Jerz making falls under the metalworking or blacksmithing craft in Oman – something which the Sultanate’s people are famous for. A typical Jerz is just under a meter in length and a few centimeters in diameter. The axe head is about 10 centimeters long. The silversmith craft and culture in Oman is unique and fascinating. This is due to the fact that over several centuries, the silversmiths and metalworkers of Oman have taken design elements in silverware manufacture from all over the world – especially India, East Africa, China, various Middle Eastern centres and even Europe – and come up with a unique style of their own that is inspired and influenced by the Omani culture and identity. 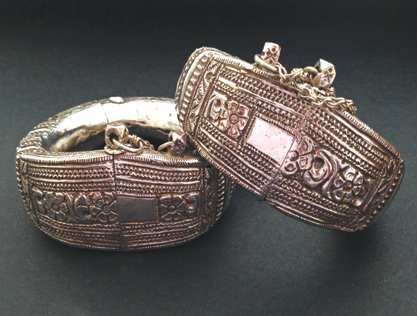 Nizwa is renowned for its high quality silverware, but silver products can be found throughout the Sultanate. Throughout Oman’s history, women have worn kohl around their eyes. The function of khol is a cosmetic one – and it is said to give a woman’s eyes more expression. Kohl is a paste traditionally made from finely powdered sulphide of antimony mixed with rosewater – and in some cases, wood ash mixed with vegetable oils. These days, kohl is commercially available, but the traditional, hand-made version is held in high esteem, and worn with pride. 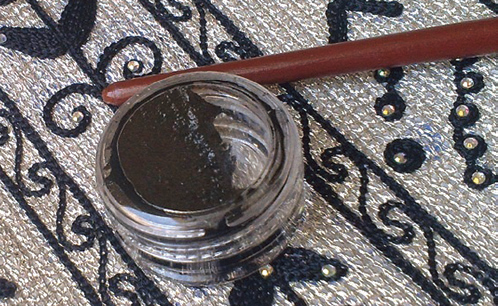 An Almekhala is a small metal bowl (it is sometimes made of silver) used to contain kohl. Balad Sayt is a mountain village located just over 200 kilometers west of Muscat, approximately on the border between the A’Dakhiliyah and A’Batinah Governorates. The village is an exquisite example of what ‘Old Oman’ was like – a trip here feels like a trip back in time to an era where you might never want to return from! The village is located on the slopes of the Hajar Mountains near the highest peak in the Sultanate of Oman, Jebel Shams. The town of Rustaq is located just less than 60 kilometres away (about an hour’s drive) from Balad Sayt, and is a good place to stock up with supplies for the day, or for a camping trip. Due to the relatively high altitude, Balad Sayt enjoys moderate daytime temperatures – even during the peak summer months. The village is surrounded by the awe-inspiring peaks and valleys of the Jebel Shams mountain range. A camera is essential! There are some spectacular natural camping sites next to the few kilometers of road that ascend towards the village. Campers need to bring all amenities and supplies with them – including lots of water. Many of the village buildings are constructed in the vernacular style – they have been built the same way for hundreds of years using locally sourced clay, mud, stone and date palm fronds. The village itself is next to the local people’s date palm plantations and agricultural terraces. The final approach to the village involves a steep climb, followed by an exhilarating descent into the mountain and valley oasis. Due to its inaccessibility and out-of-the-way location, Balad Sayt’s natural and cultural beauty is unspoiled. Balad Sayt is accessible only via rugged mountainous roads, so a four-wheel drive vehicle is highly recommended. There are many sinkholes in Oman, but Bimmah is the most impressive. Since it is only an hour’s drive from Muscat, it is also one of Oman’s most popular tourist sites. It is well worth a visit. Bimmah Sinkhole has been attracting travelers and locals to its crystal clear waters for a long time. A walk down the stairs to the water’s edge – and even a swim in the Bimmah’s refreshing waters –is something too enticing to miss. Bimmah Sinkhole was formed by the collapse of a large underground cave, due to natural erosion. Remnants of the cave can be seen at the base of the hole. Access to the sinkhole is free, and there are picnic and toilet facilities available. After a site-seeing trip to Bimmah, travelers often continue their drive through to the coastal town of Sur, which is the traditional home of dhow building in Oman. Tiny fish can be found in the pool and sometimes, they gently nibble on your toes. The sinkhole is approximately 60 meters by 80 meters wide, and about 25 meters down to the sinkhole is located the water level. In Hawiyat Najm Park, which is about an hour’s drive south-east of Muscat, and just off the Muscat-Sur road. Bimmah sinkhole is only about 600 meters away from the Sea of Oman shoreline. A park and viewing platform have been built around the sinkhole – as well as a stairway that leads down to the water’s edge. The natural lighting conditions at the sinkhole and the iridescent blue-green color of the water make for wonderful photographs. The sinkhole contains salt water that is crystal clear – with underwater visibility up to 20 meters at certain times. Oman and its people have a long and rich history with the sea. For thousands of years, Omani merchants and sailors have journeyed into the Arabian Sea and Indian Ocean in search of trade and adventure. 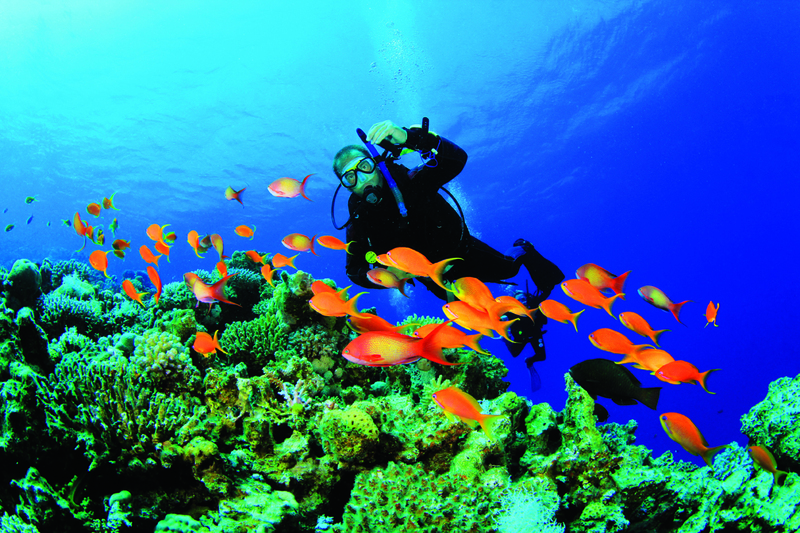 In modern times, Oman has become well known for its spectacular diving potential. The jewel in the crown of Oman diving is the Daymaniyat and Sawadi Island chain, which is located about 75 kilometers east of Muscat, beginning just off the coastline at Barka. While the Sawadi Islands are always worth seeing, the nine main islands that make up the Daymaniyat Islands Nature Reserve, which are further out to see, are the most impressive. From Nabucco´s Al Sawadi Beach Resort to the uninhabited island group, it is just a 45 minute trip with the Extra Divers Worldwide dive boat. (The Extra Divers Al Sawadi centre forms the closest base from which to dive the Daymaniyats). The islands begin about 18 kilometers out sea, and are clustered together in three groups – often referred to as the Western, Central and Eastern (including the Southeastern islands) sections. There are between 20 and 30 dive sites scattered around the area – all of which are accessed via boat. However, the nature of the undersea terrain means that at almost any point, there is a fascinating array of marine life to experience, and underwater features like caves, drop-offs, huge boulders and underwater swimthroughs to explore. During the trip out to the islands, dolphins are also often encountered. Coral reefs with dozens of hard and soft coral species cover up to 70% of the dive sites. The marine life is prolific and there are all kinds of colorful reef fish and large pelagic fish in abundance. Various types of sharks and rays, and numerous other large and small marine creatures (including the much-loved seahorses) are all part of the experience. 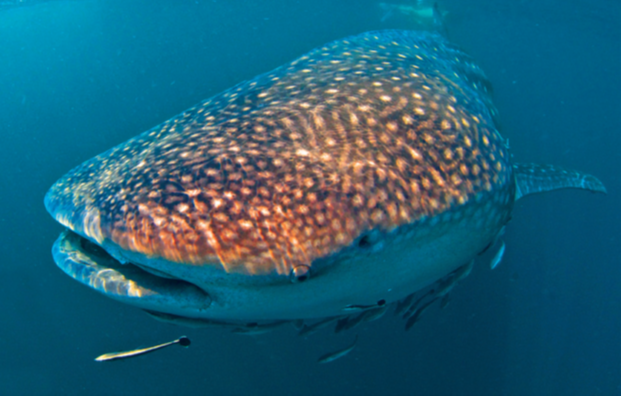 Whale Sharks are also frequent visitors here during the summer months – from around July to September. ‘There is not much in the world that can compare to an encounter with a whale shark,’ says Gerrit Schneider, from Extra Divers Worldwide. Turtles are common too, with many returning during the summer months to lay their eggs on the island’s white, sandy beaches If you aren’t a qualified scuba diver, you’ll still be able to experience the marine life and sea creatures by snorkeling. Typically, you’ll join a boat of divers heading out to the islands, and while they’re busy underwater, you’ll be able to explore the shallower patches of coral reef in the area. Under the water, or at the surface, the Daymaniyats are not to be missed! London The World Capital of Museums? According to a recent survey, London now boasts close to 1 000 museums, 8 000 restaurants, 200 theatres, over 120 000 hotel rooms for all budgets, and five international airports. The ‘Capital City of the World’ really does have a lot to offer. And they’re certainly world leaders when it comes to that first statistic – museums. In fact, London could be called the World Capital of Museums as well. 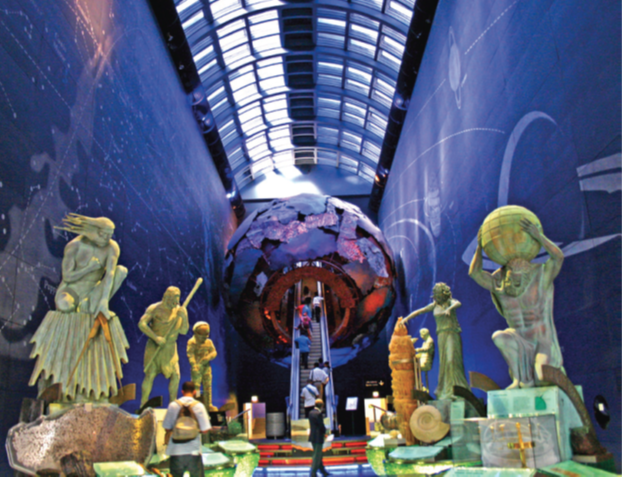 What sets London’s museums apart from the rest of the world’s offerings is firstly, the truly remarkable items that they contain – it is spectacular to know you’re looking at the actual Rosetta Stone, or an original Leonardo Da Vinci drawing, or a real Egyptian mummy, or the handcuffs used by the famous escape artist Harry Houdini. The second is the way each museum’s contents are cared for and curated and presented in a way that makes them absolutely fascinating and relevant to our lives. And of course, everyone just loves the idea that entrance to most of the museums and galleries is free. People often think that museums are dusty, old, boring places, but London’s are the exact opposite. Four museums – the British Museum, Victoria & Alfred Museum, Natural History Museum and the Science Museum – stand out in particular. More than once, the British Museum has been called the greatest attraction in London. Its collection, which has been sourced from all over the world, is among the most comprehensive in existence, and illustrates the story of human culture from its early beginnings to the present day. If you only have a short time, make sure you see the Rosetta Stone, Assyrian Lion Hunt reliefs, Parthenon sculptures, Samurai armor and as much of the Egyptian department as you can. 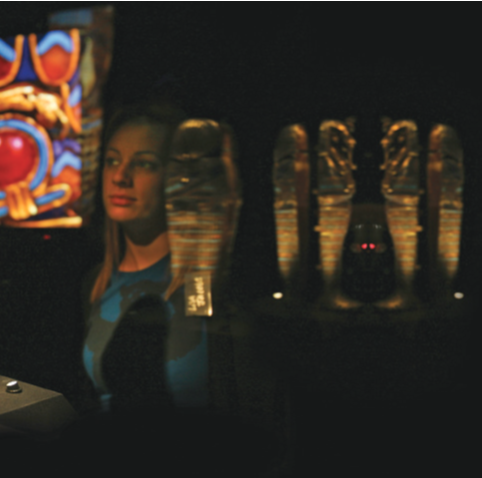 The Victoria & Alfred Museum celebrates art and design with 3 000 years’ worth of extraordinary and noteworthy artifacts. 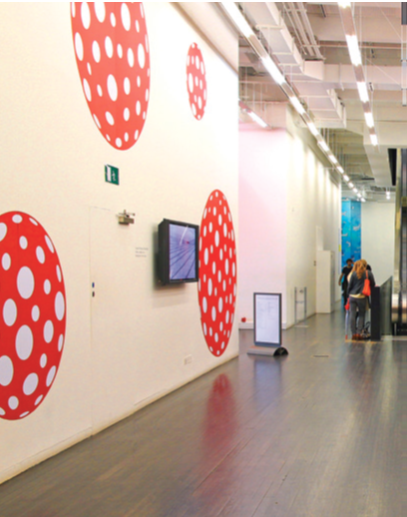 Some 150 galleries on seven floors contain furniture, ceramics, sculpture, paintings, posters, jewellery, metalwork, glass, textiles, and much more. And no, these priceless treasures aren’t for sale – as much as you’d love to buy them! As well as the impressive dinosaur exhibit, the Natural History Museum boasts a collection of the most spectacular and rarest animals in the world. Want to see a life-sized blue whale? Or a 40 million year-old spider? Or thousands of plant, animal, fossil and rock specimens? Then this is where you – and especially your kids – want to be. The Science Museum features seven floors of educational and entertaining exhibits – all showcasing developments in contemporary science and technology. The highlights are the famous Apollo 10 space command module and a flight simulator, which are very popular with children. These four London museums are reasons enough to travel to London and an entire lifetime could be dedicated to the study of each museum’s contents. If you are limited in time, each one has an expertly compiled website with suggestions and summaries of what specific items to see, and information on new and upcoming exhibits. There are other museums, well worth spending a good deal of time at. Among the vehicles on display at the London Transport Museum is the first underground electric train which interestingly, had no windows because there was nothing to see underground. The Imperial War Museum contains examples of the machinery and technology of war – as well as communications and spying equipment, war literature and other artifacts from conflicts of the twentieth century. Military history fanatics will also enjoy the National Maritime Museum, where one of the highlights is the famous Admiral Lord Nelson’s uniform from the Battle of Trafalgar. The Design Museum features contemporary furniture design, graphics, and architecture and industrial design concepts – and altogether tells the story of why good design is so important and relevant to the world right now. The Museum of London is an entertaining education of the city’s history. It is packed with exhibitions that tell the story of prehistoric London, the city under Roman rule, and the grandeur of medieval London and other important stages in its history. A prominent part of London’s museum culture is its art museums and galleries. The quality of the works permanently on display and on once-off exhibitions is spectacular. London’s National Gallery is filled with works by great masters such as Vincent Van Gogh and Leonardo Da Vinci. The gallery was founded in 1824 to display a collection of just 36 paintings, but today it is home to more than 2 000 works. The popular Tate Britain gallery is referred to by the Tate institution as ‘The home of British art from 1500 to the present day’ and is not to be missed by serious art fans. The Tate Modern gallery, another of the Tate institutions, is housed in the former Bankside Power Station on the banks of the River Thames. Here you can see work by the likes of Pablo Picasso, Salvadore Dali, Jackson Pollock and Andy Warhol. Other acclaimed galleries include the Barbican Art Gallery, Hayward Gallery, National Portrait Gallery in Trafalgar Square, The Royal Academy of Arts (founded in 1768), and the small Serpentine Gallery, which sits in a beautiful spot in the middle of Hyde Park. Recently, the mayor of London, Boris Johnson, lovingly exclaimed that his city is the ‘greatest big city on the planet’. Being the mayor, this is could be considered an unashamedly biased claim. But Mr Johnson isn’t the only chap who likes London. At the end of 2013, a survey revealed that a record number of travelers (possibly in the region of 16 million – they’re still counting the final quarter) made their way to London last year – many of them to the city’s brilliant museums. If you do too, you will not be disappointed! 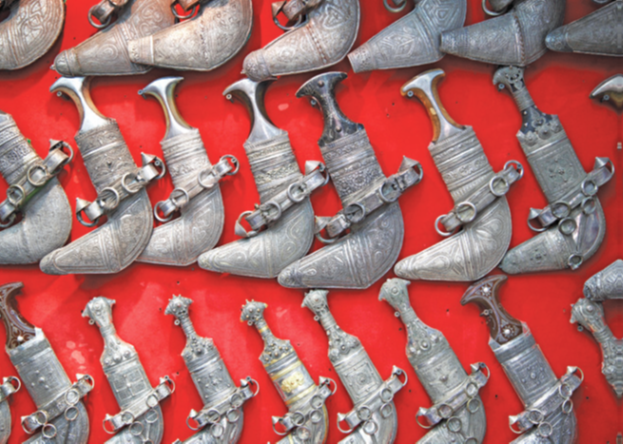 The Khanjar is the traditional dagger of Oman, and forms part of the Omani man’s formal dress. The blade of the dagger is curved, sharpened on both edges, and is carried in a handsomely decorated silver sheath worn around the waist. Khanjars are held in high esteem in Omani society, and a Khanjar appears on the flag of Oman, as part of the national emblem. Oman is famous for its pottery, and Bahla, in the A’Dhahirah Governorate, is considered the traditional home of this highly regarded craft. 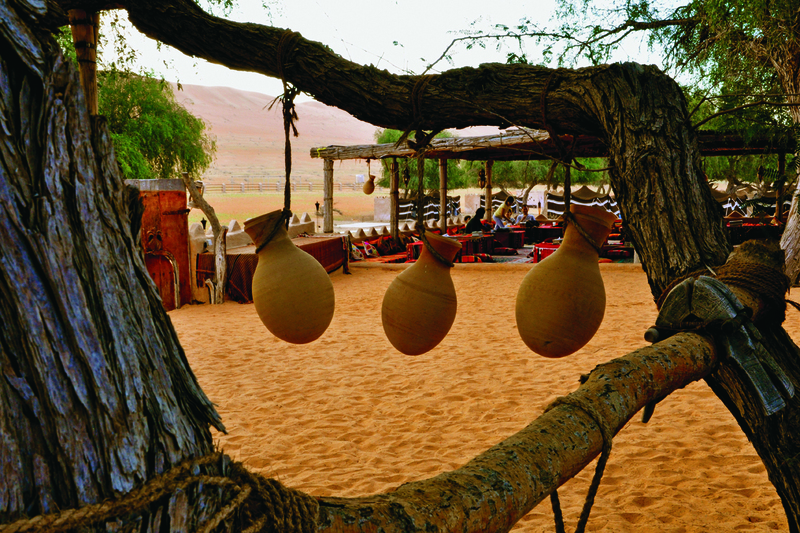 Omani pots are made out of clay gathered from the floors of wadi river beds, and they are used to store water, dates, honey and other household items. The Kumah is the traditional cotton cap worn by Omani men. Due to the intricate embroidery required in the design, and the length of time needed to produce each one, they are highly prized and can fetch very high prices. However, mass produced Kumah caps are commonly sold at lower prices from souqs and malls. 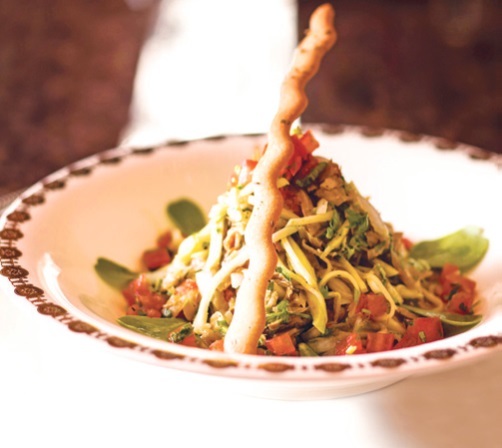 Farfina Salad: Watercress salad with white onion and cherry tomato garnish with lime dressing. Eggplant Salad: Roasted eggplants with garlic flavor, garnished with chilies and coriander. Awal Salad: Duo of sun-dried baby shark meat flakes and green mango accented with white onion, dressed with fresh tomato coulis. Harees Laham Soup: Creamy whole wheat soup, slow cooked with lamb pieces seasoned with hints of cardamom and cinnamon. Tomato Soup with Dry Limes: Omani take on classic tomato soup, slow cooked with whole sun dried Omani limes to flavor. Alkarasea Soup: Traditional clear goat leg soup slow cooked with vegetables, lightly spiced with ginger and red chilies. Omani Shuwa: Traditional roasted lamb marinated with special ‘shuwa’ spices and vinegar, covered with banana leaves and slow roasted overnight in an underground pit. 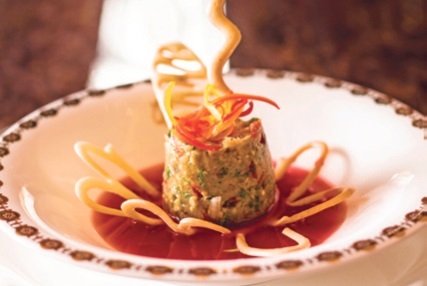 Arsia Laham: Mashed rice with lamb, flavored with cardamom with special sauce ‘turshe’. Qabuli with Camel Meat: Rice cooked in ‘qabuli’ spices served with camel meat. Maraq Ma’ajeen: Sun dried meat stewed and lightly flavored with garlic and coriander. Maraq Mashakik: Mashakik meat cubes stewed in tangy tomato sauce. Mahmas Laham: Sautéed lamb with roasted onions and tomatoes flavored with a little ginger. Marqat Pablo: Light king fish stew with onions, tomatoes, green chilies, saffron and lemon juice. Salqat Al Samak: Broth of hamour fish with onions and tomatoes with hint of zaatar (thyme). Samak Mtafai: Pan-fried king fish served with tangy tomato and tamarind sauce. Marqat Al Dijaj: Chicken stew, lightly flavored with garlic, accented with fresh coriander. Marqat Al Dijaj Bil Narjeel: Chicken stew with a creamy coconut and tomato sauce lightly spiced accentuating the flavor. Salqat Al Dijaj: Broth of corn fed chicken flavored with lime and zaatar. Marqat Al Dal: Classic lentil stew with distinct Omani flavor. Dengu Mqashad: Lentil stew prepared with onions and lightly spiced with cumin seeds. Garlic Jareesh: Creamy broken wheat slow cooked with milk and onions, flavored with garlic. Omani Halwa: Gelatinous Omani sweet, made from fine ingredients, flavored with saffron, cardamom and rose water. Asida Bi Dibs: Soft crumble flavored with cardamom and saffron, served with dibs (date syrup). Khabissa Bil Findal: Sweet potatoes prepared with sweet dough. Wadi Dayqah Dam is the Sultanate of Oman’s largest dam. As far as man-made bodies of water are concerned, it is undoubtedly one of the worlds most beautiful as well. Wadi Dayqah is about an hour’s drive south-east of Muscat, and one of the most accessible sites in the Sultanate. A walk along the gigantic concrete dam wall, followed by a picnic on the grass adjacent to the dam, makes for an ideal half-day trip and an absolute ‘must-do’ item for travelers. 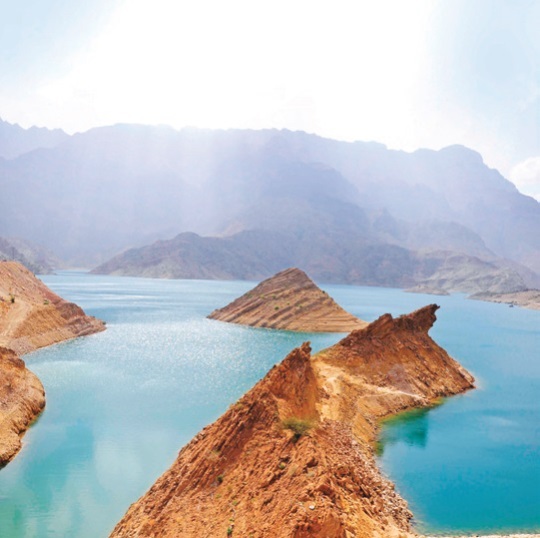 One of the defining characteristics of Wadi Dayqah Dam is that it is surrounded on all sides by the peaks of the Hajar Mountain Range. The combination of this huge body of water, and sheer cliff faces on all sides (some over 1 500 meters high), is spectacular. On a clear day, the dam and surrounding areas are a paradise for a photographer. There is a small restaurant at the main lookout area, but you’ll also be well off bringing your own picnic lunch or breakfast to enjoy at the garden area, where there are grassy and shaded areas to sit around. For the adventurous, there are a few informal trekking paths leading north along the dam’s shoreline. Originally, about 120 wadis flowed into the area that now contains the dam. There is still a year-round low of water through the dam, with winter being the peak period. The storage capacity of the dam is about 100 million cubic meters. The entire expanse of water covers an area of 350 hectares. The dam wall itself is 390 meters long, and just over 73 meters high. A walk along the top of the dam wall gives a literal bird’s eye view of the entire area: Views of the dam, the mountains, and the wadi and small town below the wall. Access to the dam wall and picnic area is free.